Integral's UltimaPro SDHC and SDXC Class 10 memory cards are ideal for use in DSLR and compact digital cameras and Full HD camcorders. UltimaPro SDHC/XC 80MB Class 10 specification perform at up to 80MB/s transfer speed and are designed to be used where fast memory cards are crucial to capture high-resolution images and to shoot Full HD video. HD videos and large megapixel photos can be saved to the UltimaPro memory card at rapid speed, with no lag or dropped frames. 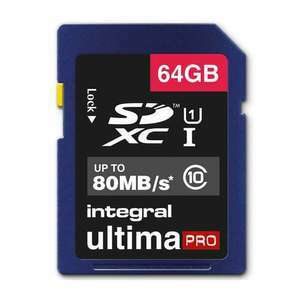 If you require a high performance memory card for your camcorder, digital SLR or digital compact camera, choose Integral UltimaPro. Integral UltimaPro SDHC/XC are Class 10 Speed to ensure that when you take a picture, data is saved faster, so there is less time to wait before taking the next picture, perfect for Digital SLR cameras and premium compact cameras. hella cheap but watch out! Have a similar integral 64 card been fine for approx 3 years,got for£3.03 on amazon. gets perfect reviews on my memory. I suspect somebody has been selling fake cards on amazon. Have a similar integral 64 card been fine for approx 3 years,got for£3.03 …Have a similar integral 64 card been fine for approx 3 years,got for£3.03 on amazon.gets perfect reviews on my memory.I suspect somebody has been selling fake cards on amazon. How'd you manage to pull that excellent Deal off?, hehehehehehe. Do you happen to have a link for it by any chance?. "got for£3.03 on amazon. "How'd you manage to pull that excellent Deal …"got for£3.03 on amazon. "How'd you manage to pull that excellent Deal off?, hehehehehehe.Do you happen to have a link for it by any chance?. My mistake was back in 2015. Oh WOW! !, that was a beautiful price for two of those!, I'd paid more than than that for just each (around the same 2015 time). IF I'd obviously had seen that same Deal as yours around that time, I'd have blatantly smashed it for £20 at that particular moment in time (then bounced for ages off of that), I was still just about rocking 1 or 2 Digi Cam's then, so full SD's would have done me perfectly. How time's have changed, huh? (for everything ... lol).